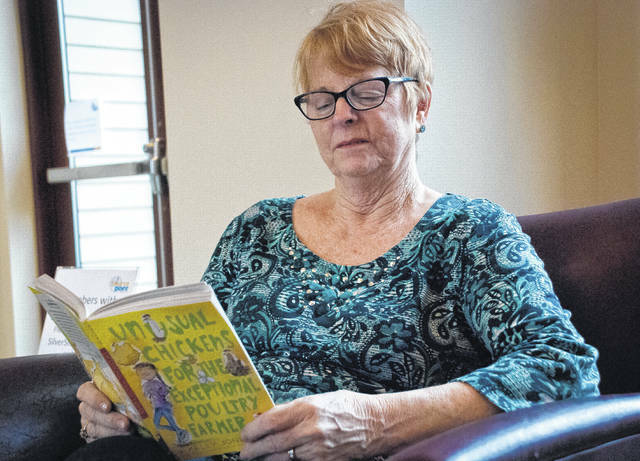 Pen pal Pat Holobaugh sits in the lobby at SourcePoint catching up on the book “Unusual Chickens for the Exceptional Poultry Farmer,” which Conger Elementary students are reading as part of the pen pal program. Holobaugh said she was a little behind in the book and needed to catch up. What happens when fifth-graders at Conger Elementary are paired up as pen pals with volunteers from SourcePoint? The realization they have plenty in common despite the many years between them. Amber Bauer, Conger Elementary fifth-grade teacher and coordinator, said the program wasn’t her idea, nor did she start it. “It was a teacher at Buckeye Valley that started the pen pal program,” she said. Bauer said she only volunteered to keep the program going. She added the kids are told their pen pals are older. She said some of the kids are a little apprehensive at first, but as they write back and forth with each other, they find they have a lot in common. Both the fifth-graders at Conger and the volunteers at SourcePoint were given the assignment to read “Unusual Chickens for the Exceptional Poultry Farmer” by Kelly Jones. The two pen pals write back and forth discussing their ideas about the books. Bauer said some of the kids were unaware that there are many different colors of chickens besides white. She also said they didn’t know that of some the chickens were egg layers only, and others were raised for meat. Not all of the kids’ questions are centered around the books they are reading at the time as the volunteers get some pretty interesting questions asked about themselves. Martha Fikes said she has been a pen pal volunteer for six years. In those six years, Fikes said, the books they have read that stick out in her mind were about Vietnam and one about the Cuban Missile Crisis. Fikes said she tries to make a connection with her pen pals. At least she doesn’t directly. Fikes said she learns about her pen pals’ families or what fascinates them. Fikes said they would also talk a little about the book, but his letters to her were mostly about trains. John Brinkerhoff said this was his second year participating in the pen pal program, and he plans to continue with it as long as it is offered. He said he thought it was a very smart program. Brinkerhoff said the adults benefit as well as the kids by seeing how smart and considerate young ones can be. Once the book is read and the letters have been written back and forth between the pen pals, they finally get to meet. Usually, there is a small party that brings the pen pals together. Bauer said the kids are always excited to meet the pen pals and will make posters about a week ahead of the meeting. This year’s program is different from past years as it’s now at the Stratford Ecological Center on Liberty Road. Stratford received a grant that allowed the organization to buy the books and host a party at the end of the program. Fikes said some kids have never put their hand in a running stream. She hopes the experience gives them a little exposure to nature. Bauer said that some of the kids will continue to write their pen pals when they are well into college. “One of the pen pals from last year is in touch with her pen pal from last year,” she said. This entry was tagged Bauer, Center, D. Anthony Botkin, ecological, Fikes, Penpals, stratford. Bookmark the permalink.